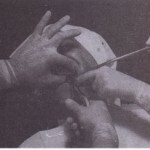 In the correct position for extraction of maxillary left or anterior teeth, the left index finger of the surgeon should reflect the lip and cheek tissue; the thumb should rest on the palatal alveolar process (Fig. 7-59). In this way the left hand is able to reflect the soft tissue of the cheek, stabilize the patient’s head, support the alveolar process, and provide tactile information to the surgeon regarding the progress of the extraction. When such a position is used during the extraction of a maxillary molar, the surgeon can frequently feel with the left hand the palatal root of the molar becoming free in the alveolar process before realizing it with the forceps or extracting hand. For the right side, the index finger is positioned on the palate and the thumb on the buccal aspect.